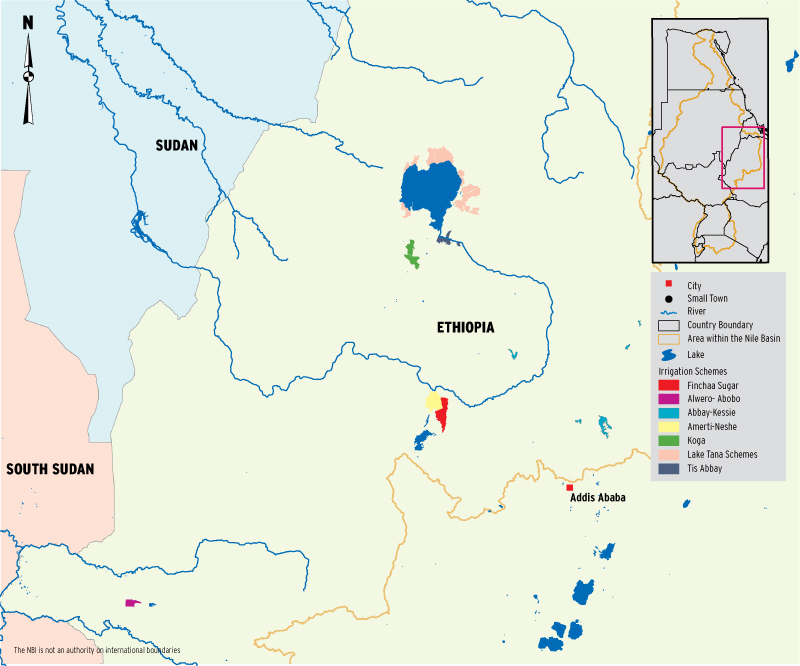 The total area equipped for irrigation in Ethiopia in the Nile Basin is about 91,000 ha. All except one scheme lie in the Blue Nile sub-basin. Lying in relatively high rainfall area, irrigation of these areas is supplemental where the rainfall is expected not to meet the crop water requirements. Nearly half (46%) of the irrigation area depends on the flow of the Blue Nile without a storage facility that would regulate the highly seasonal flows of the river. As a result, the schemes face shortage of water during the dry season. With the exception of the Fincha irrigation scheme, which uses sprinkler system, all irrigation in Ethiopia in the Nile Basin relies on surface – gravity method for water conveyance and application. There is a marked value added in irrigated agriculture. The total estimated annual water use for irrigation in Ethiopia is estimated at 1.5 BCM. Growing population pressure in the highland areas of rain fed agriculture on a rapidly declining natural resource base has secured irrigated agriculture a prominent position on the country’s development agenda.